Initial tethered capture support for recent Nikon and Canon SLRs. New rendering engine, new sharpening, new grain, new noise reduction, new tone-curve control, etc. I used the new point-curve tone control to create the freaky rendition above, of a photo from February's ski trip with Anthony. Unofficial support for Chinese (two flavors), Dutch, French, German, Italian, Japanese, Korean, Portuguese, Spanish, and Swedish. For an overview of the user-visible changes, see the release notes in the Lr3b2 download, or even better, the traditional go-to exhaustive list is Victoria Bampton's “What's New” post. For more of an in-depth presentation of the bigger items, see here, here, and here (et en français, ici). Is Lr3b2 Ready for Prime Time? Do make sure to see the “Primary Known Issues” in the release notes, including warnings about being a beta and keeping backups and data loss and such, but for what it's worth, unlike the first beta which was pretty rough, I think this one is good enough for prime time, and I use it for all my new photos. I don't use Lr2 anymore, except for testing and for old stuff. You can install Lr3b2 on the same machine that Lr2 is installed on, and even use them at the same time if your machine is beefy enough (though I don't see much benefit in running them at the same time). Internally, Lr3b2 includes a bunch of new goodies for plugin development, some of which I've been able to take advantage of already. For example, I've just released a new Snapshot on Export plugin that allows one to have Develop snapshots created automatically on export. It's sort of like a “data backup” of the export-time develop settings, that you can revert to in case you accidentally (or purposefully) make later develop changes, but the need to recreate the image exactly as exported..
You can select individual focal lengths, or ranges, to save as well, so you can easily inspect your lens-use habits along these lines. 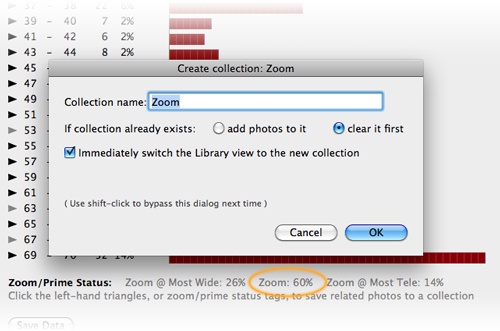 This particular enhancement is of interest only if you actually use my data-plot plugin, but the concept — that plugins can now work directly with Lightroom collections — bodes well for future workflow-improving plugins. Some improvements are so subtle that you might not notice them unless they're pointed out. For example, in Lr2 and Lr3b1, those using my Extended-Search plugin had to remember to deselect all images before invoking it, an unintuitive hassle resulting from a limitation in the Lightroom plugin infrastructure. Now, in Lr3b2, the plugin can tap into the “do the right thing” selection mechanism that Lightroom itself uses, for a more intuitive user experience: if you have a bunch of images selected, they'll be worked on, but if you have just one image (or no images) selected, the plugin will work on all images in the filmstrip. With the video support new in Lr3b2, I can finally retire my kludgy Video-Asset Support plugin. It was a maintenance nightmare, so I'm happy to see it go. The plugin is still useful in Lr2, but once the real Lr3 comes out and everyone can upgrade their Lr2 catalogs to Lr3, the video-asset plugin can finally be fully decommissioned. Woo-hoo! A few new tokens are available in my plugins that use my preset template language, allowing you to select date and time formats in your favorite system localized format. I use the new localized dates in some of my plugins as well (for example, in the “uploaded at...” metadata item created by my exporter plugins). There are plenty of other little changes and enhancements that I'm probably not thinking of at the moment. I've been so steeped in this for the better part of the last year that it's sometimes hard to keep things straight. Regular readers of my blog will have noticed that I've put up significantly fewer posts in the last few months... besides having some nasty colds, I've been working on Lr3-related things almost 24/7. The “Publish” feature, which first appeared in Lr3b1, is still not ready for prime time. The simple Flickr plugin that Adobe includes in Lr3b2 works as far as it does, but my export plugins — including my Flickr plugin that is much more feature-laden than Adobe's — still can't take full advantage of the promise that Publish offers, so full support is still a work in progress, targeting the real Lr3. I was surprised and excited by the tethering capability (for doing macro in studio), but it’s really limited for now. Just point, shoot and transfer the picture. Hopefully it’ll get better. Kudos for the new “snapshot-on-export” option. Really is a valuable feature that I’ve been hoping to see. So exciting. I love the new noise reduction. 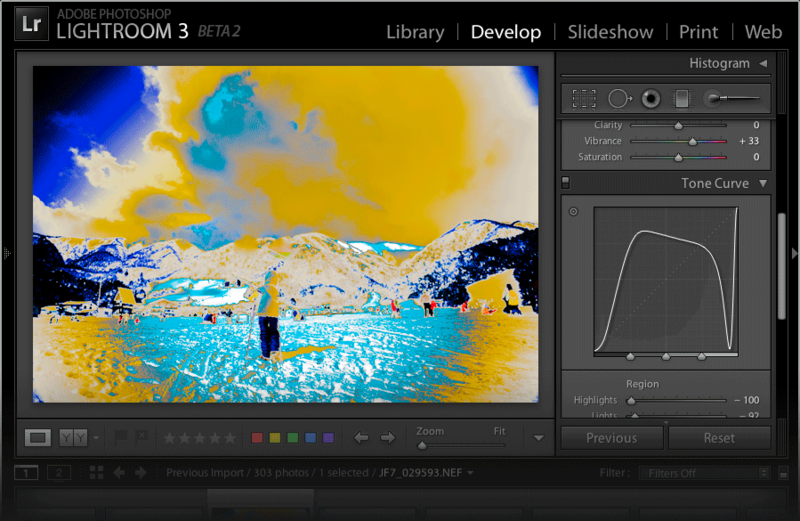 Hi Jeffrey, will the Run Any Command plugin work with LR3? I hope so, this is such a central piece of my workflow! As a LR2 user, I jumped the gun and actually made a contribution for your new LR3 SmugMug export plug-in. 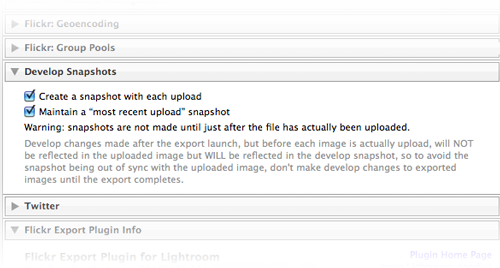 Unfortunately, I’m unable to make exports to SmugMug using your plugin. The plug-in acknowledges a connection with SmugMug. But, when export is attempted, a pop-up dialog says “Attempt #1 error “networkConnectionLost”. The popup dialog disables LR3 and I’ve had to reboot to bail out. I now upload directly using the SmugMug upload system. But, I await anxiously your comments so I can use your product.